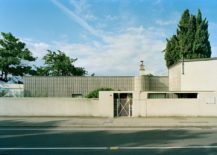 On 6 October 1887, an architectural star was born (of course the world didn’t know it then). 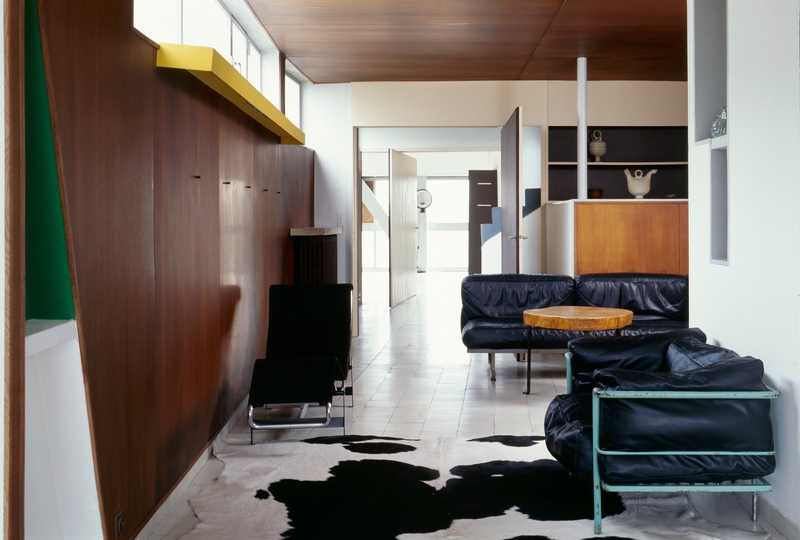 The Swiss-French Charles-Édouard Jeanneret-Gris would later adopt the pseudonym Le Corbusier and come to be an architectural tour de force. 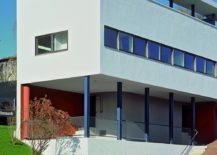 A major player in the International Style of architecture, also known as Modernism, Le Corbusier’s style typically incorporated cuboid and cylindrical shapes, flat roofs, reinforced concrete, metal and glass frameworks, and the absence of ornamentation. 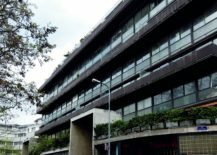 His buildings were not unduly rigid in their organisation and would incorporate open-plan interiors. 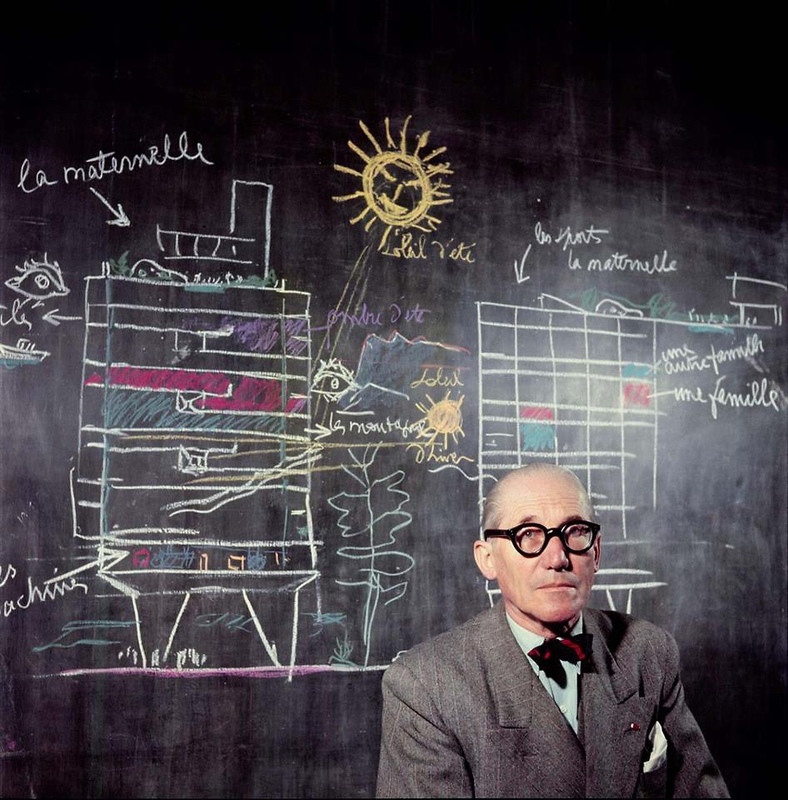 Le Corbusier in front of a section drawing of his Unité d’Habitation. Photographed in 1953 by Willy Rizzo. Image via Fast Company. 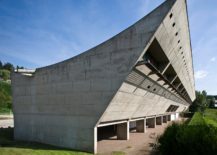 Recently, seventeen architectural works by Le Corbusier were recognised by UNESCO as having made an “outstanding contribution to the modern movement” (“The Architectural Work of Le Corbusier”, n.d.). 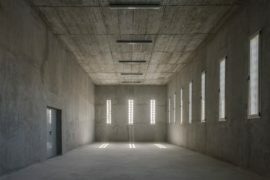 These seventeen works, built over fifty years and across seven countries, are considered a testimony to a new form of 20th century architecture, their expression making a noticeable break from past disciplines. 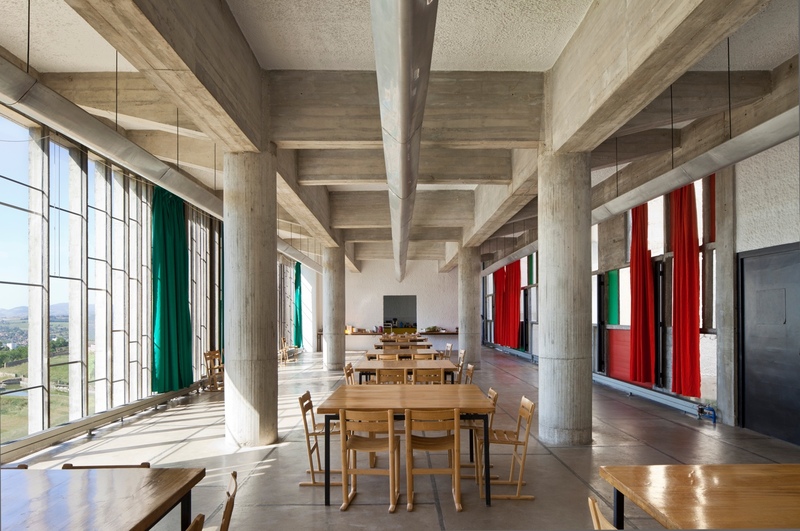 The seventeen structures have been added to UNESCO’s World Heritage List, with the agency observing that: “[Le Corbusier’s works] reflect the solutions that the Modern Movement sought to apply during the 20th century [in order to] respond to the needs of society. 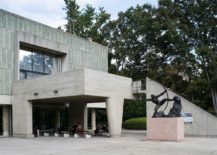 These masterpieces of creative genius also attest to the internationalization of architectural practice across the planet” (“The Architectural Work of Le Corbusier”, n.d.). 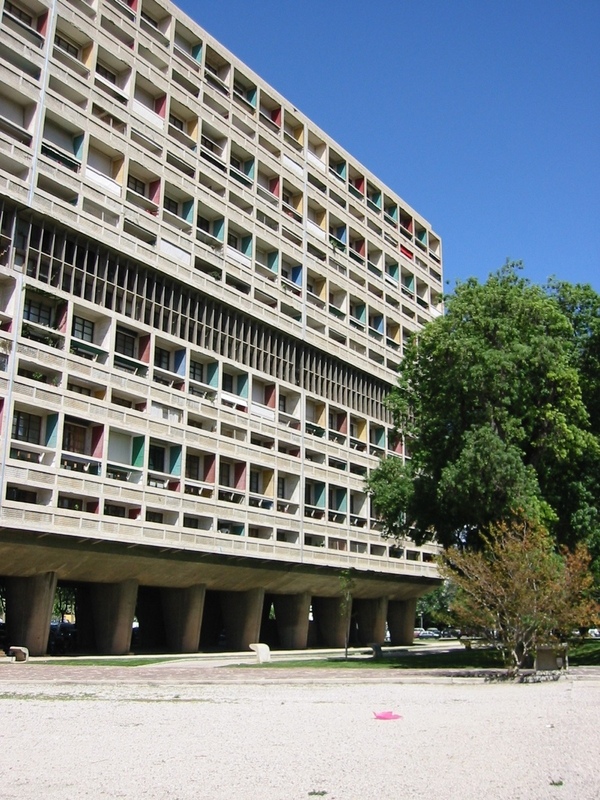 The seventeen Le Corbusier buildings selected by UNESCO are listed below in chronological order. 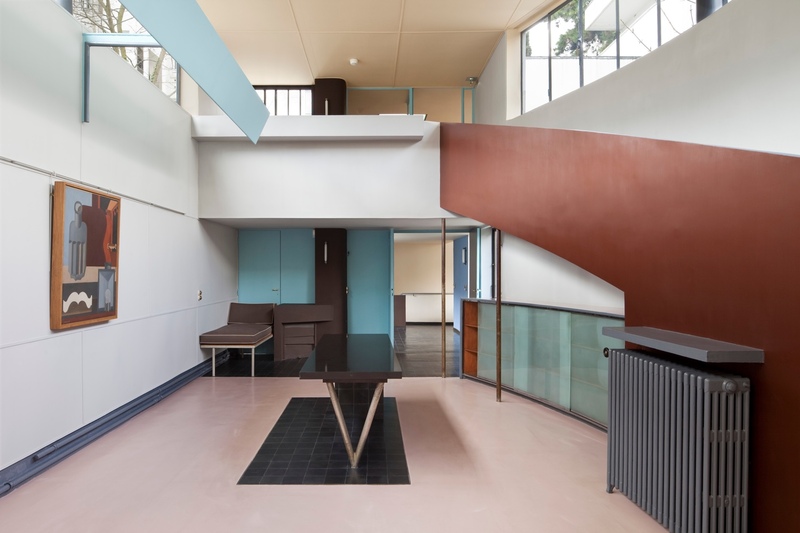 This is a single-storey modernist home that Le Corbusier designed for his parents. It includes flexible partitions and fold-out furniture. 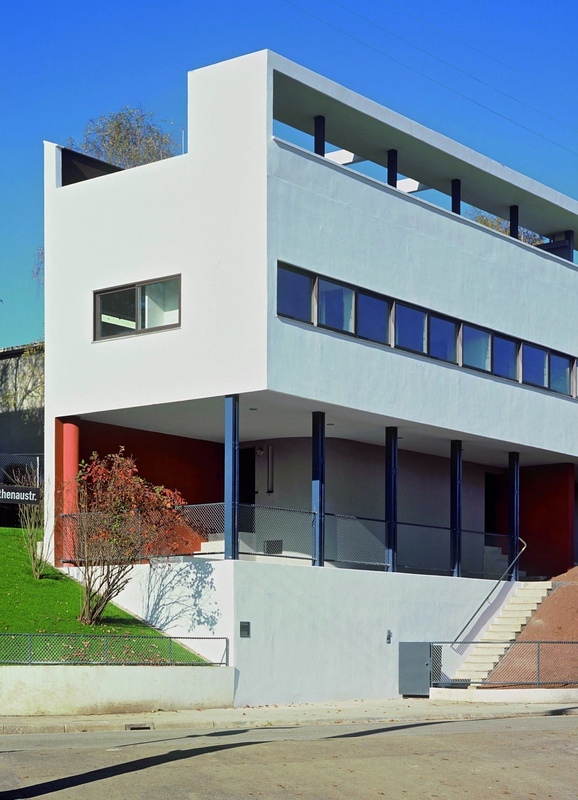 Petite maison au bord du lac Léman in Corseaux, Switzerland, 1923 – 1924. Photo by Oliver Martin-Gambier © FLC/ADAGP. 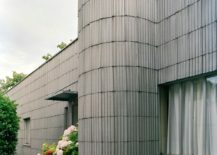 Facade detail at Petite maison au bord du lac Léman. Photo by Oliver Martin-Gambier © FLC/ADAGP. Interior at Petite maison au bord du lac Léman. Photo by Oliver Martin-Gambier © FLC/ADAGP. 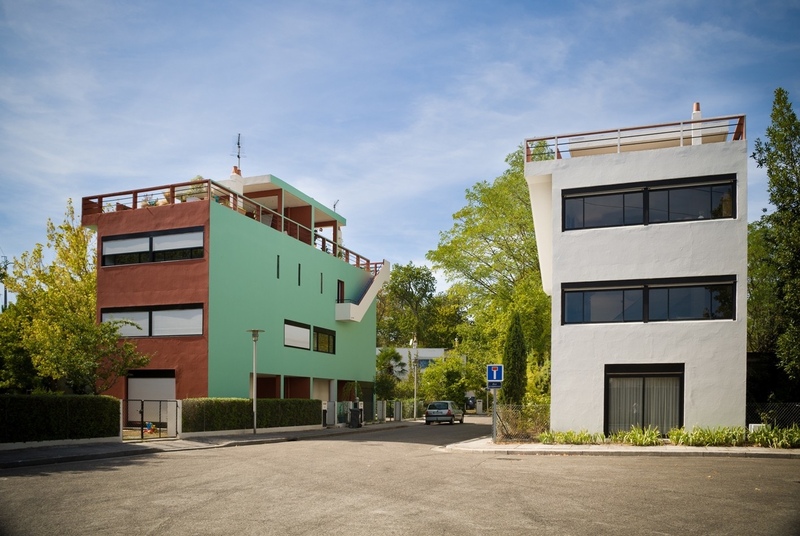 This housing development in Bordeaux was built using reinforced concrete. 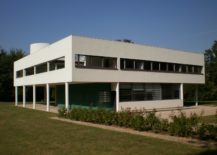 Cité Frugès, Pessac, France, 1924. Photo by Nikolas Ernult © Ville de Pessac – Nikolas Ernult. 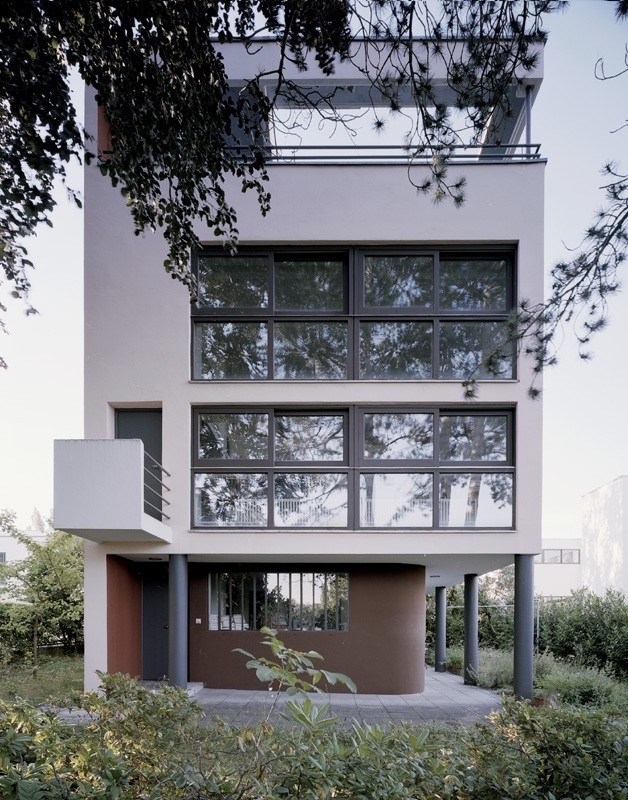 A Parisian residence for a Swiss banker, Maison La Roche-Jeanneret is the earliest architectural expression of Purism, a style emphasising the purity of geometric forms. 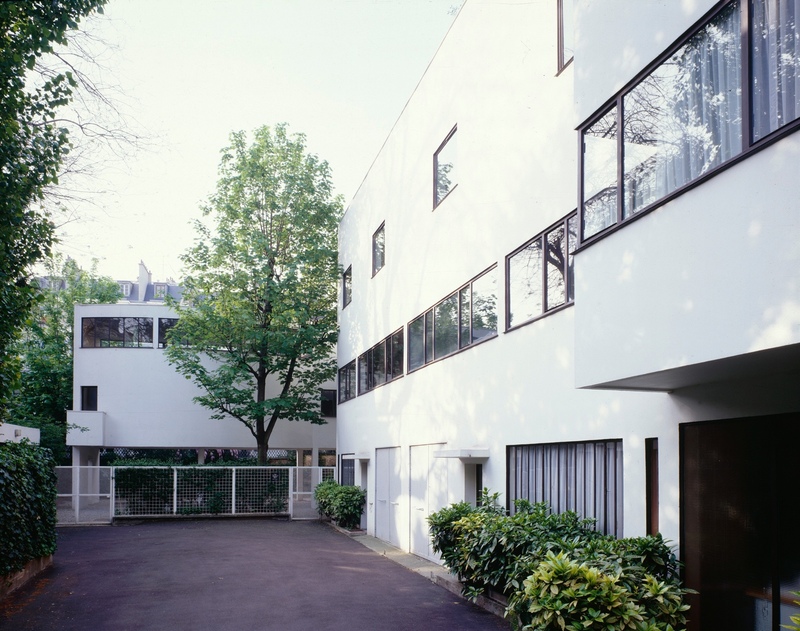 Maison La Roche-Jeanneret, Paris, France, 1923 – 1925. Photo by Oliver Martin-Gambier © FLC/ADAGP. The painting gallery in Maison La Roche-Jeanneret. Photo by Oliver Martin-Gambier © FLC/ADAGP. 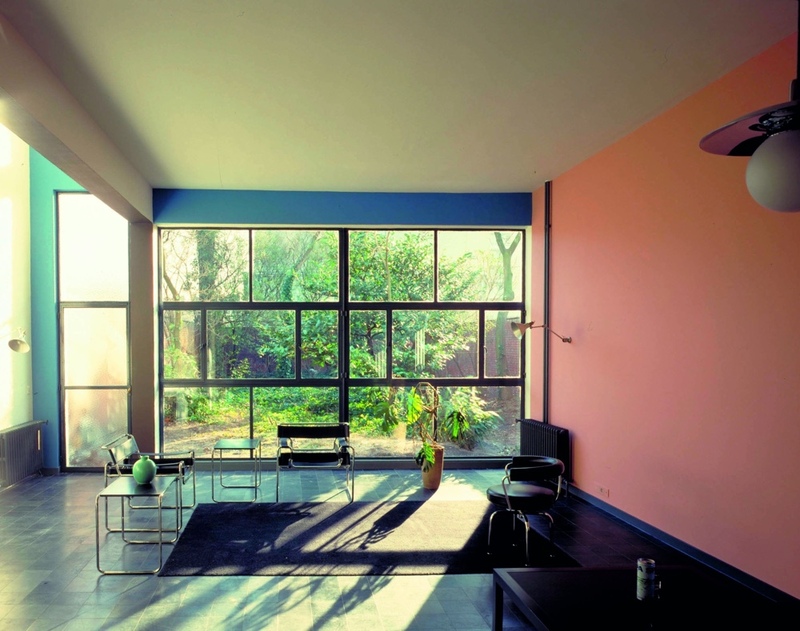 A residence and studio for the Belgian artist René Guiette. 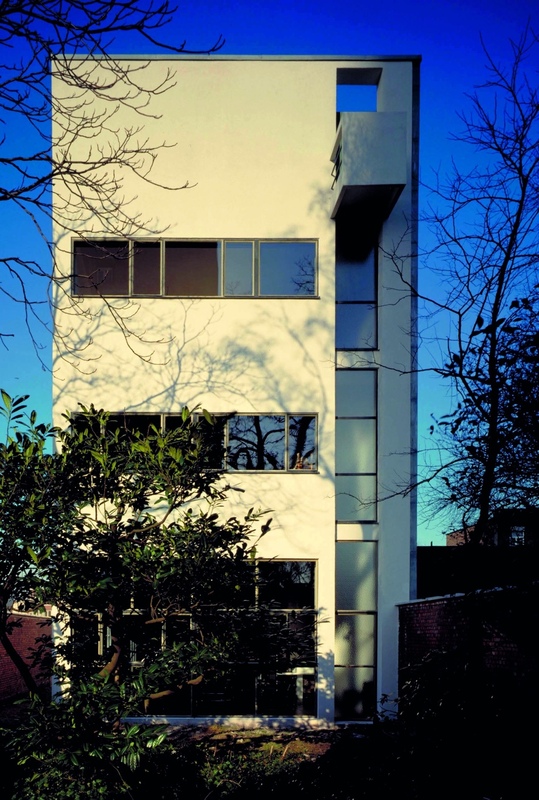 Maison Guiette, Antwerp, Belgium, 1926. Photo by P. De Prins © VIOE. Guiette interior. Photo by P. De Prins © VIOE. 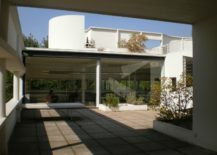 Le Corbusier designed two buildings for the Weissenhof Estate. 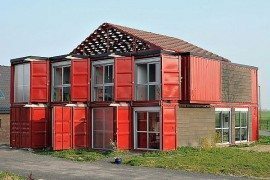 These structures were templates for mass housing and incorporated modular construction methods with the flexible use of space. 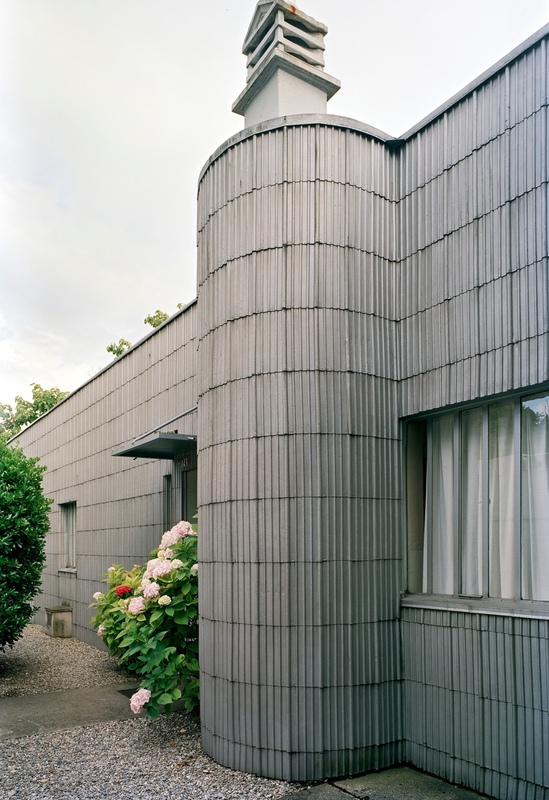 Individual house at Weissenhof Estate, Stuttgart, Germany, 1927. Photo by Birgita Gonzales © Landeshauptstadt. Twin houses at Weissenhof Estate, Stuttgart, Germany, 1927. Photo by Thomas Wolf © FLC/ADAGP. Interior in Twin houses. 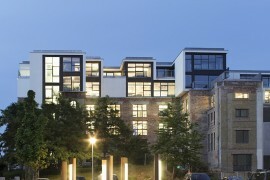 Photo by Thomas Wolf © Wüstenrot Stiftung. 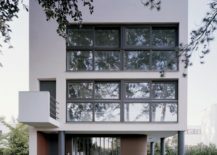 This top-heavy structure is underpinned by slim columns. 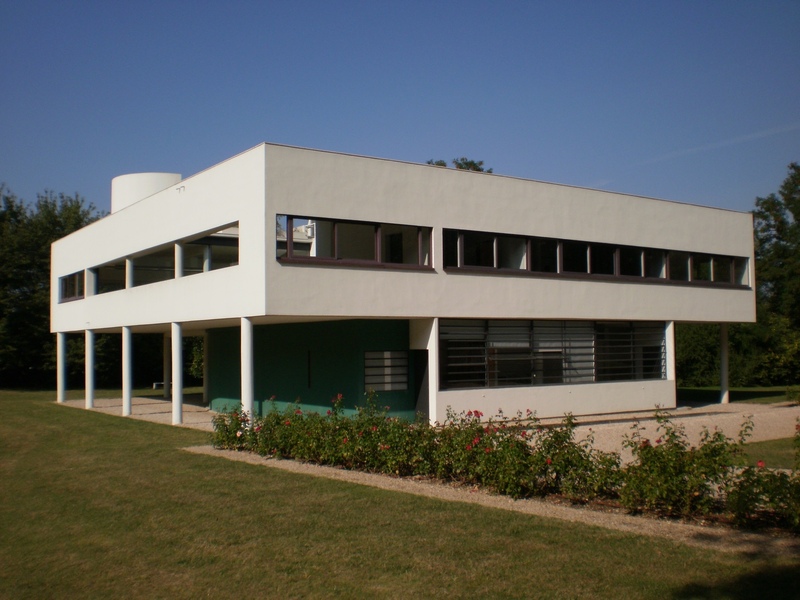 Villa Savoye et loge du jardinier, Poissy, France, 1928. Photo by Oliver Martin-Gambier © FLC/ADAGP. Villa Savoye rooftop. Photo by R. Grelaud © FLC/ADAGP. Immeuble Clarté is a delightfully utilitarian apartment complex. 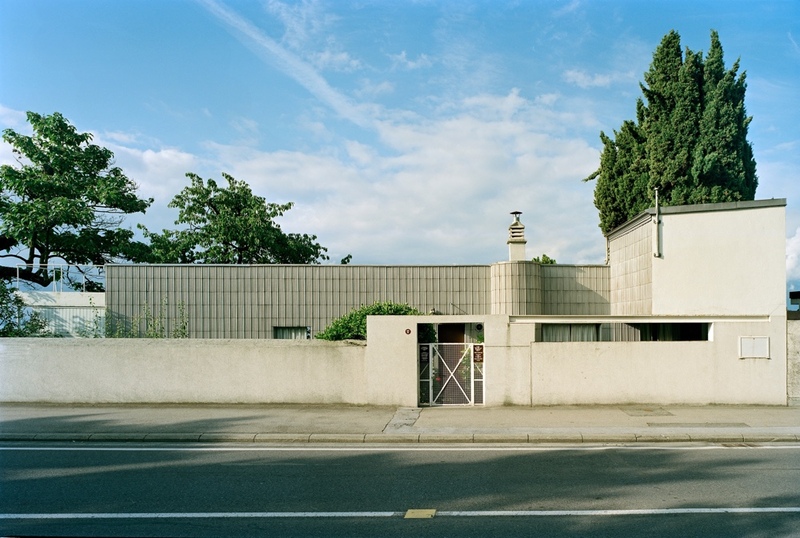 Immeuble Clarté, Geneva, Switzerland, 1930. Photo by J.J. De Chambrier © J.J. De Chambrier / OFC. Le Corbusier lived in the upper floors of this apartment complex in his later years. 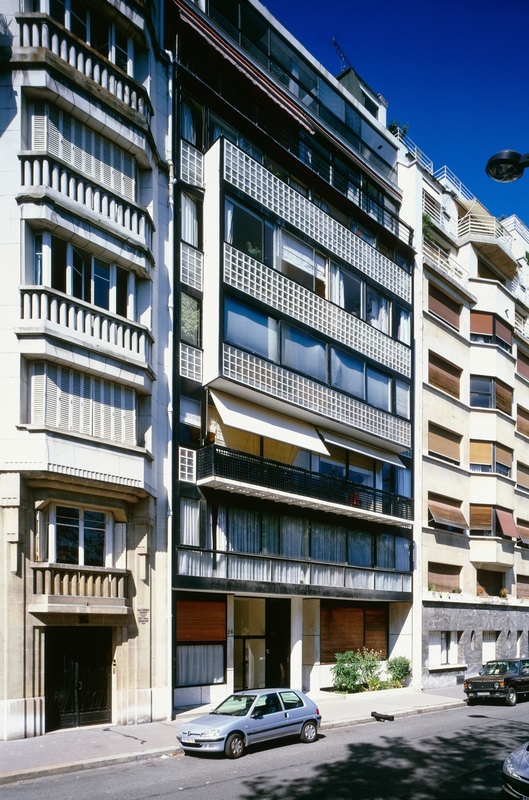 Immeuble locatif à la porte Molitor, Paris, France, 1931 – 1934. Photo by Oliver Martin-Gambier © FLC/ADAGP. 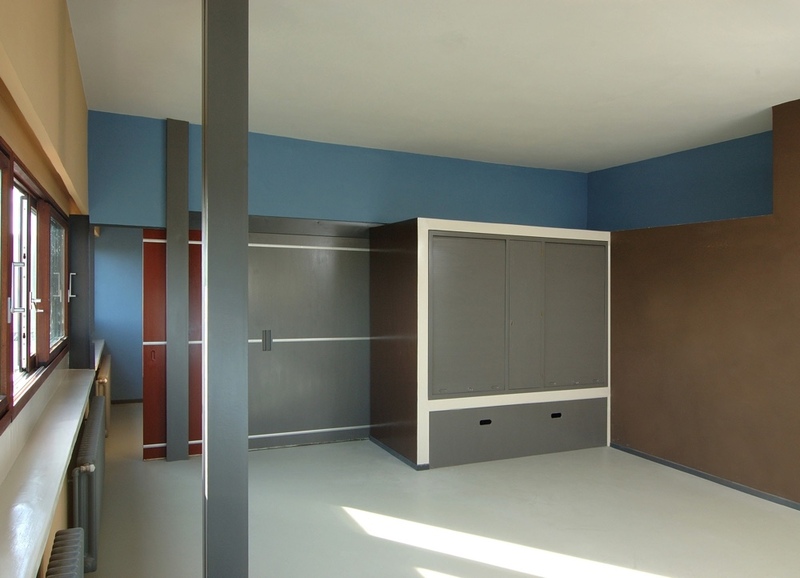 Le Corbusier’s living room in his Molitor apartment. Photo by Oliver Martin-Gambier © FLC/ADAGP. 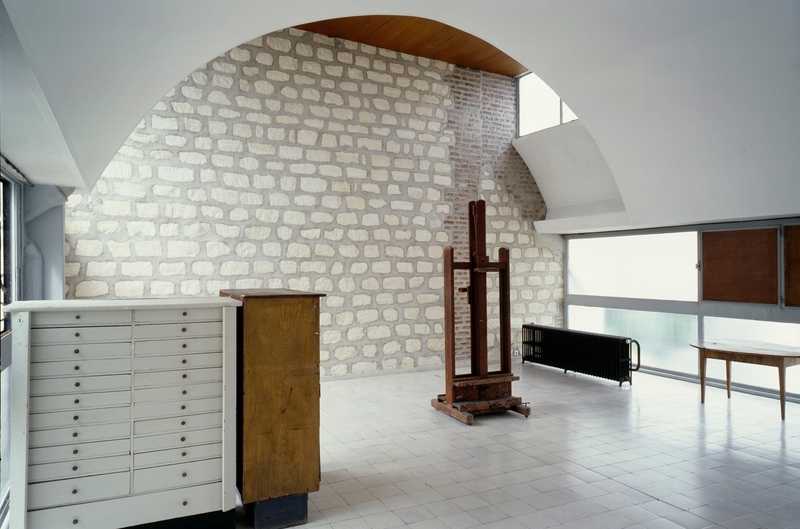 Le Corbusier’s painting studio at Molitor. Photo by Oliver Martin-Gambier © FLC/ADAGP. 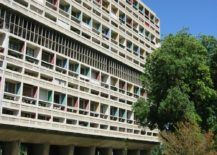 The Unité d’Habitation was an experiment in mass collective apartment living, housing 337 units of varying sizes. 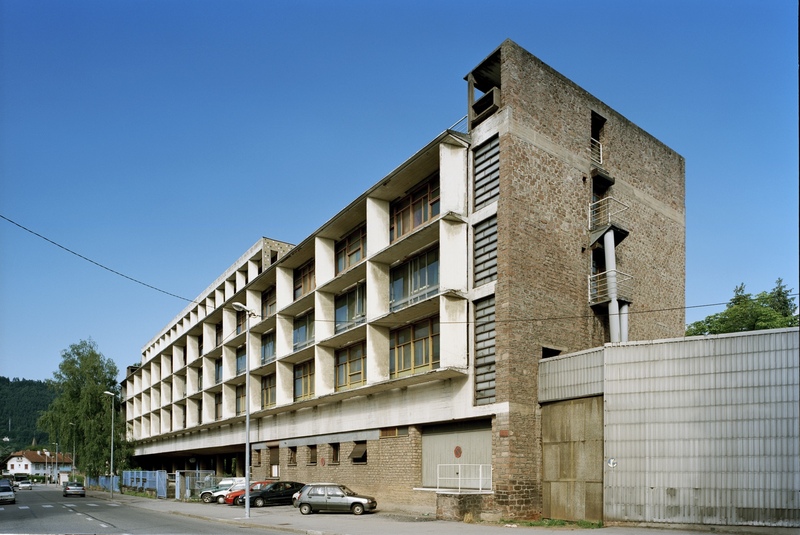 Unité d’Habitation, Marseille, France, 1945. Photo by Bénédicte Gandini © FLC/ADAGP. The shopping street at Unité d’Habitation. Photo by Bénédicte Gandini © FLC/ADAGP. 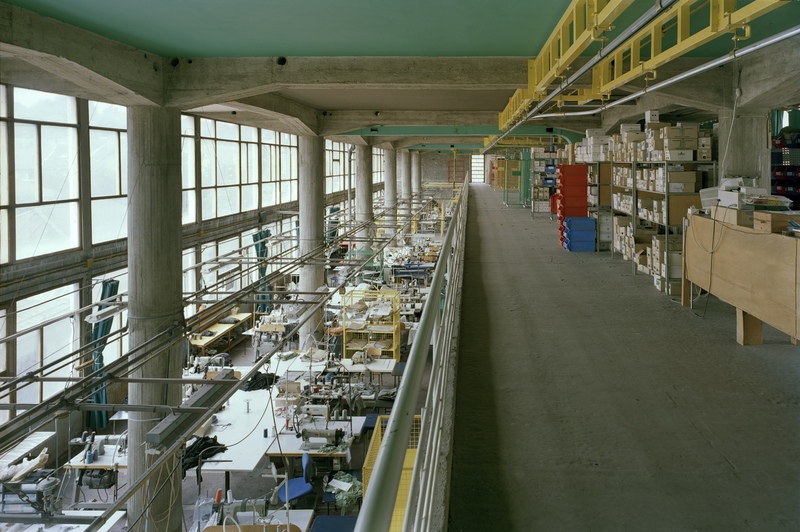 The Duval Factory, a working textile factory, was commissioned and built following the destruction of former premises during WWII. Usine Claude et Duval Factory, Saint-Dié, France, 1946. Photo by Oliver Martin-Gambier © FLC/ADAGP. Usine Claude et Duval Factory interior. Photo by Oliver Martin-Gambier © FLC/ADAGP. 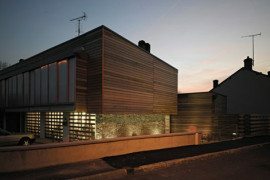 An extension to an already existing residence. 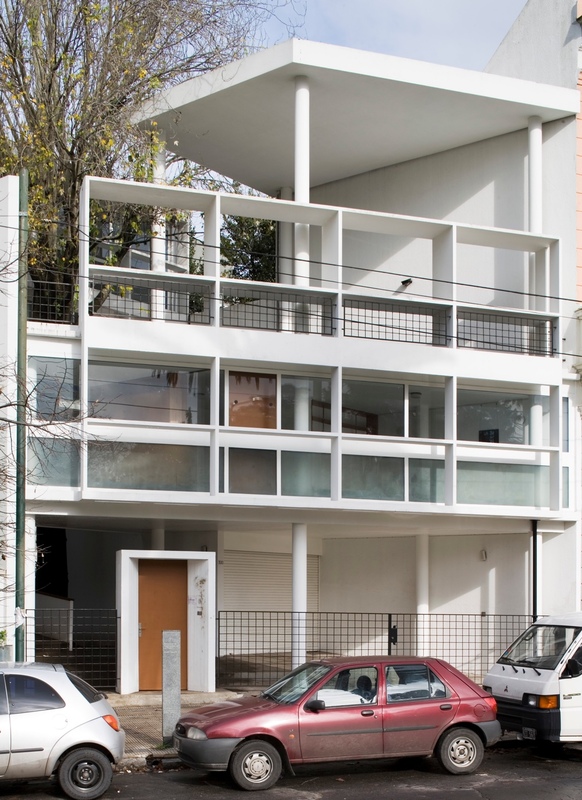 Maison Curutchet, La Plata, Argentina, 1949. Photo by Oliver Martin-Gambier © FLC/ADAGP. Ramp at Maison Curutchet. Photo by Oliver Martin-Gambier © FLC/ADAGP. 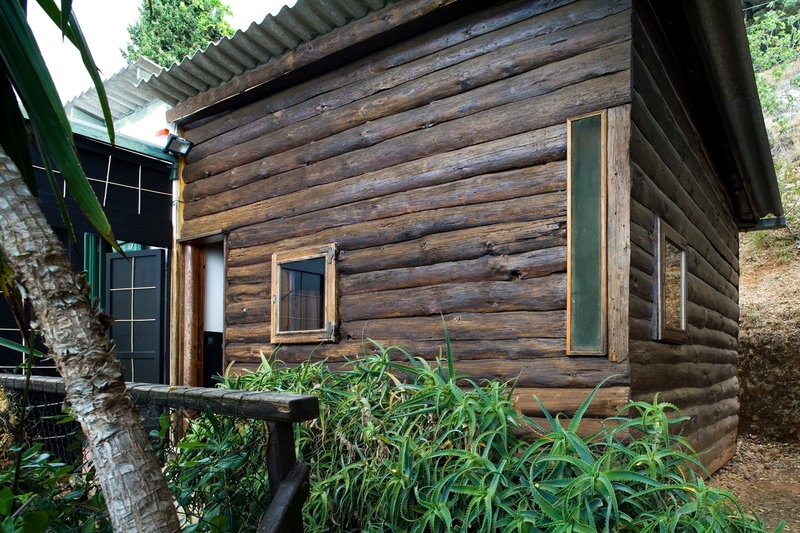 Appearing like a typical log cabin on the outside, this utilitarian dwelling’s interior is pure and simple. With a single 3.6 x 3.6-metre room, the space is basic with no amenities. 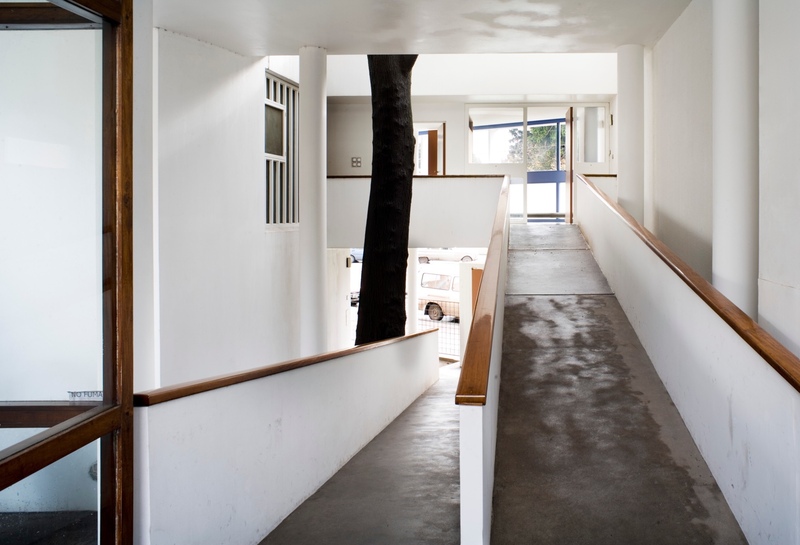 Le Corbusier used the cabin as a holiday getaway. He died in 1965 while swimming in the nearby Mediterranean. 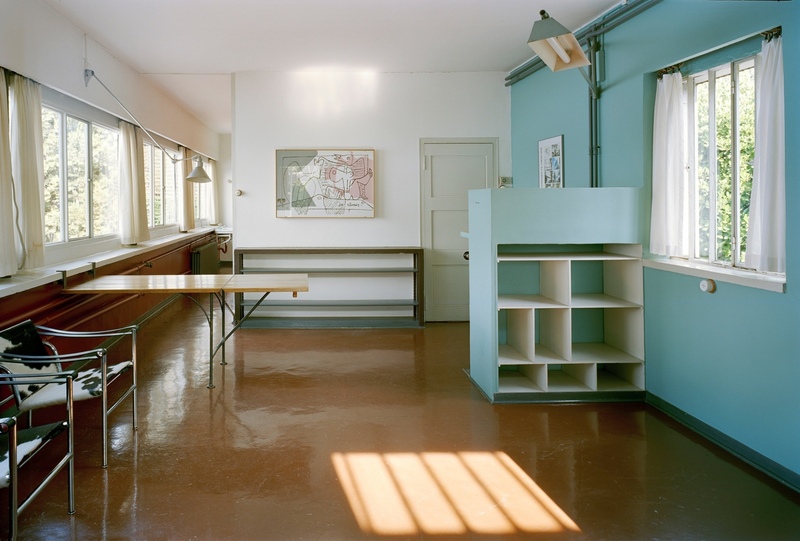 Cabanon de Le Corbusier, Roquebrune-Cap-Martin, France, 1951. Photo by Oliver Martin-Gambier © FLC/ADAGP. 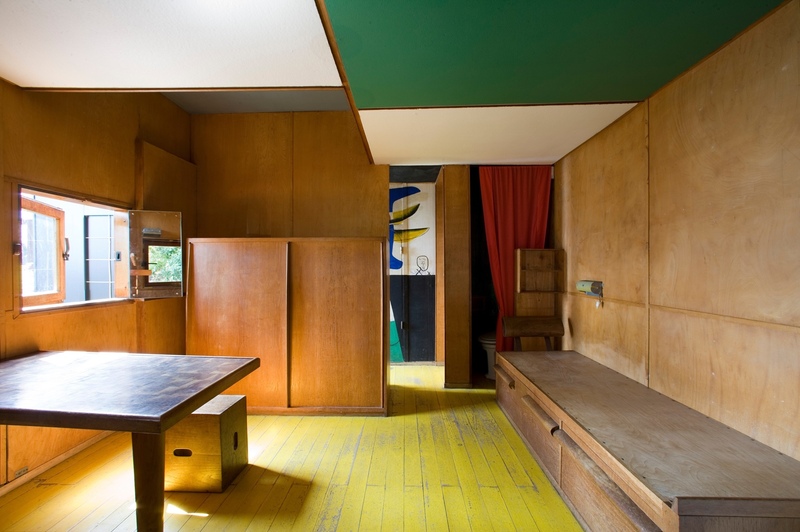 Interior at Cabanon de Le Corbusier. Photo by Oliver Martin-Gambier © FLC/ADAGP. 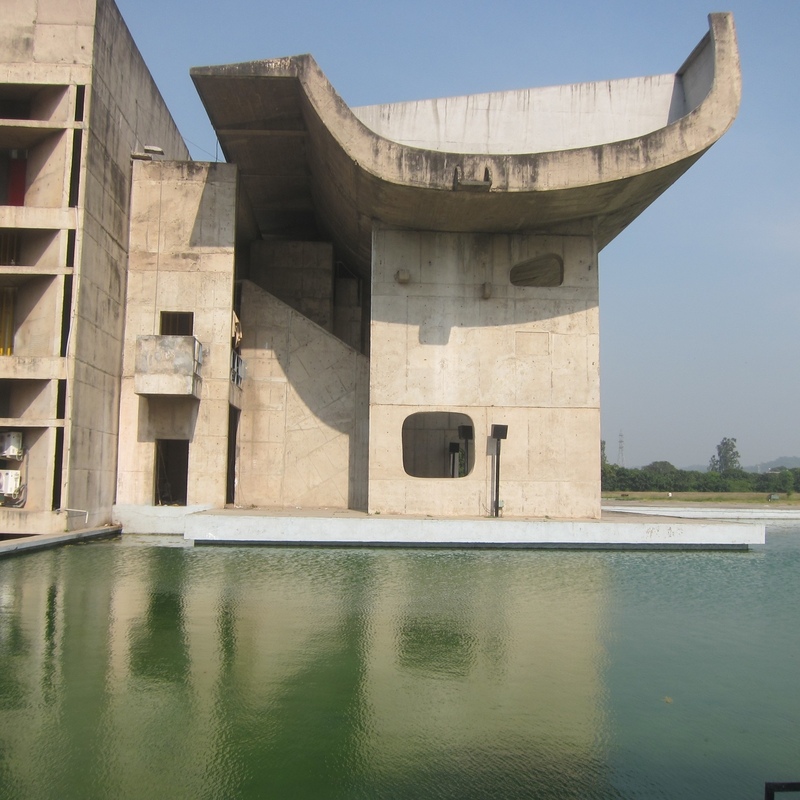 A part of Le Corbusier’s masterplan for Chandigarh in NW India, the Complexe du Capitole is a concrete behemoth. 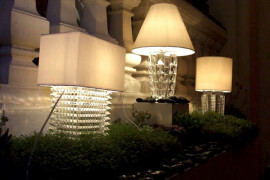 It consists of the Legislative Assembly, Secretariat and High Court. 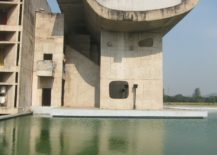 Complexe du Capitole, Chandigarh, India, 1952. Photo by Bénédicte Gandini © FLC/ADAGP. 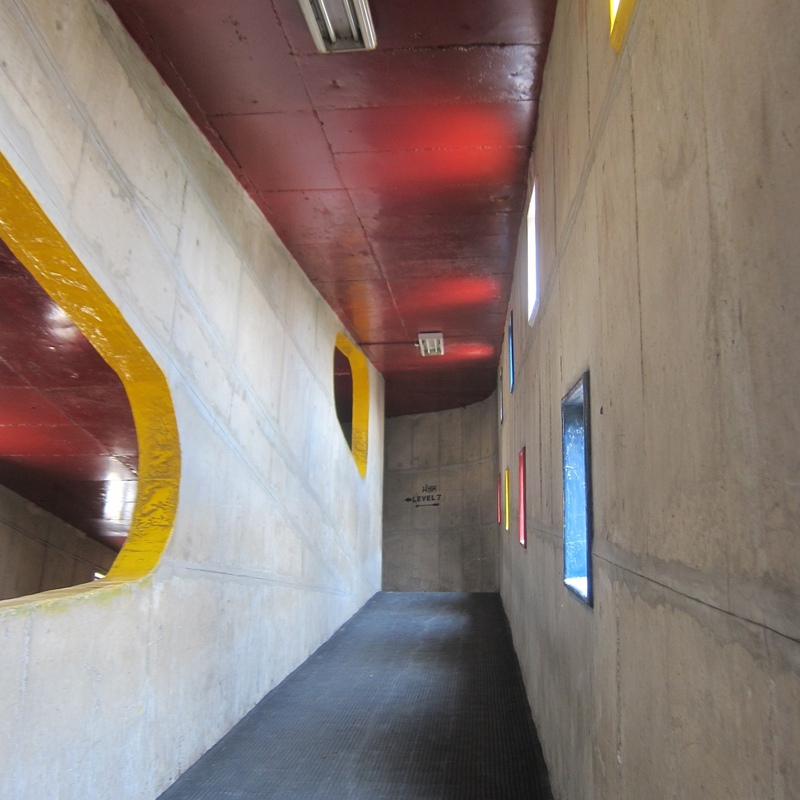 Ramp in the high courtyard, Complexe du Capitole, Chandigarh. Photo by Bénédicte Gandini © FLC/ADAGP. 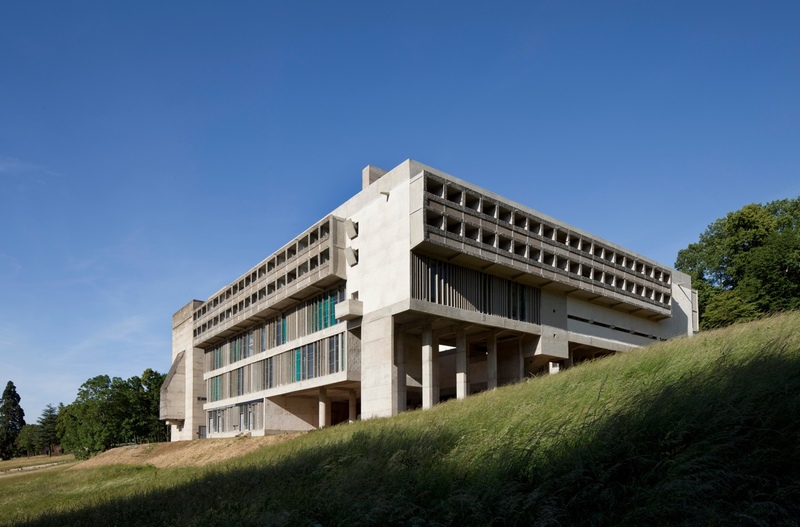 The Couvent Sainte-Marie de la Tourette is a self-contained residence built for the Dominican order. 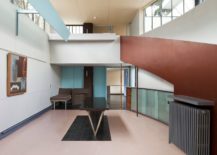 It includes: one hundred individual rooms, a communal library, a refectory (pictured below), a rooftop cloister, a church and classrooms. 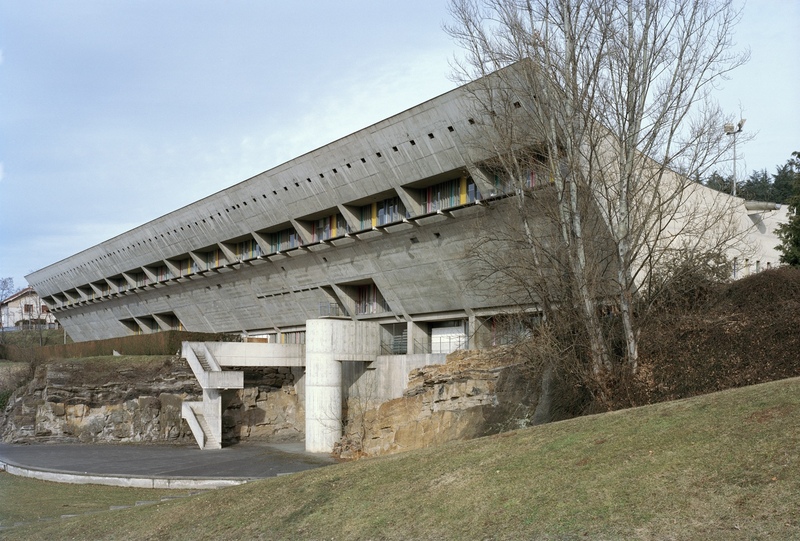 Couvent Sainte-Marie de la Tourette, Eveux-sur-l’Arbresle, France, 1953. Photo by Oliver Martin-Gambier © FLC/ADAGP. 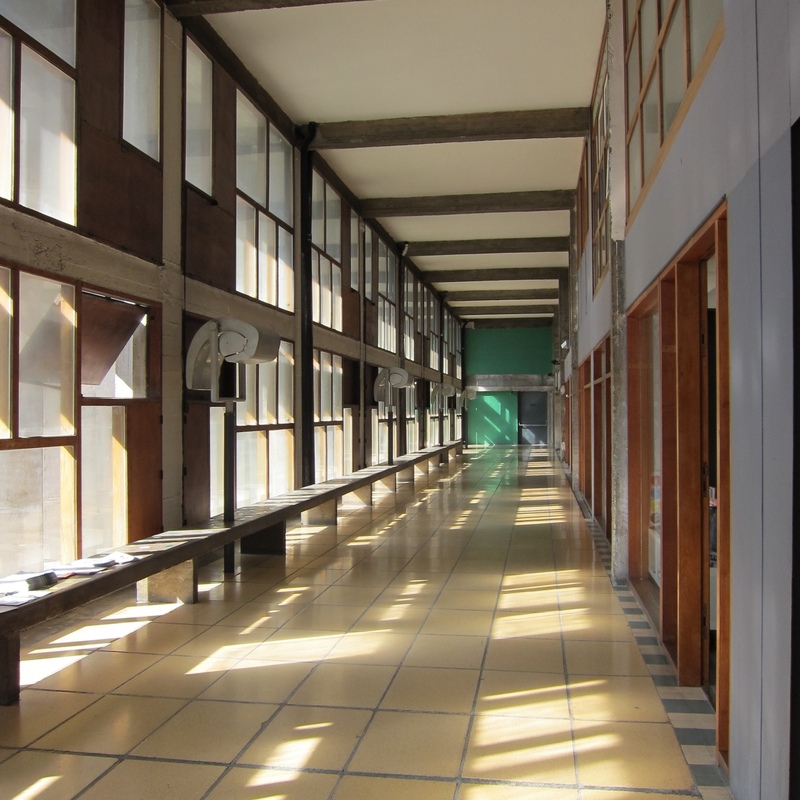 Refectory at Couvent Sainte-Marie de la Tourette. Photo by Oliver Martin-Gambier © FLC/ADAGP. Maison de la Culture is part of a bigger complex of buildings known as Firminy Vert. 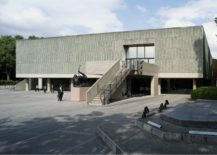 Maison de la Culture, Firminy, France, 1953. Photo by Oliver Martin-Gambier © FLC/ADAGP. 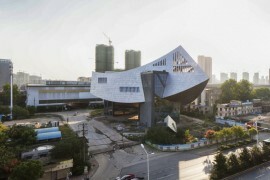 Maison de la Culture’s scooped roof. Photo by Oliver Martin-Gambier © FLC/ADAGP. 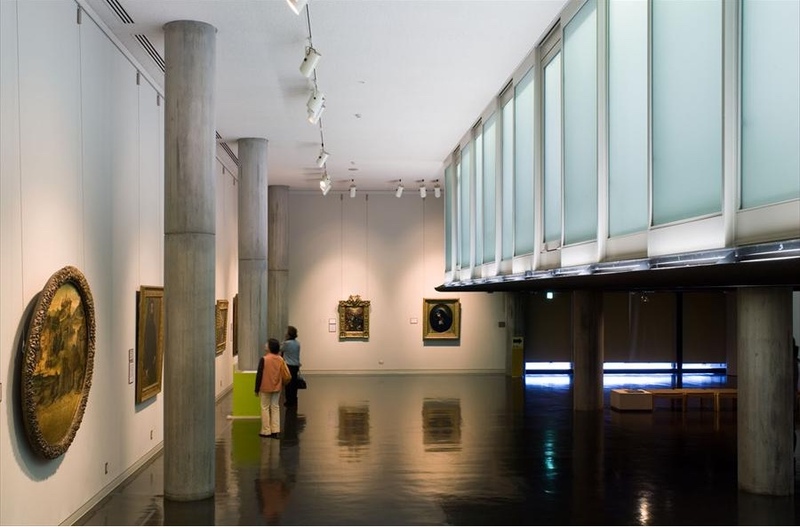 This Tokyo museum is a public art gallery that specialises in art from the West (the Occident). 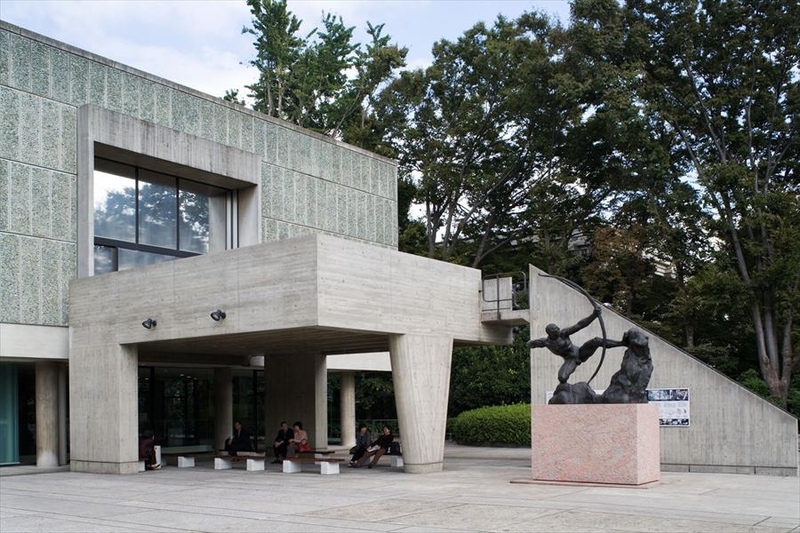 Musée National des Beaux-Arts de l’Occident, Taito-Ku, Tokyo, Japan, 1955. Photo by Oliver Martin-Gambier © FLC/ADAGP. Musée National d’Art Occidental entrance. Photo by Oliver Martin-Gambier © FLC/ADAGP. 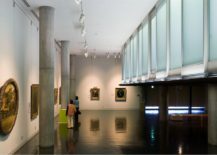 Musée National d’Art Occidental interior. Photo by Oliver Martin-Gambier © FLC/ADAGP. 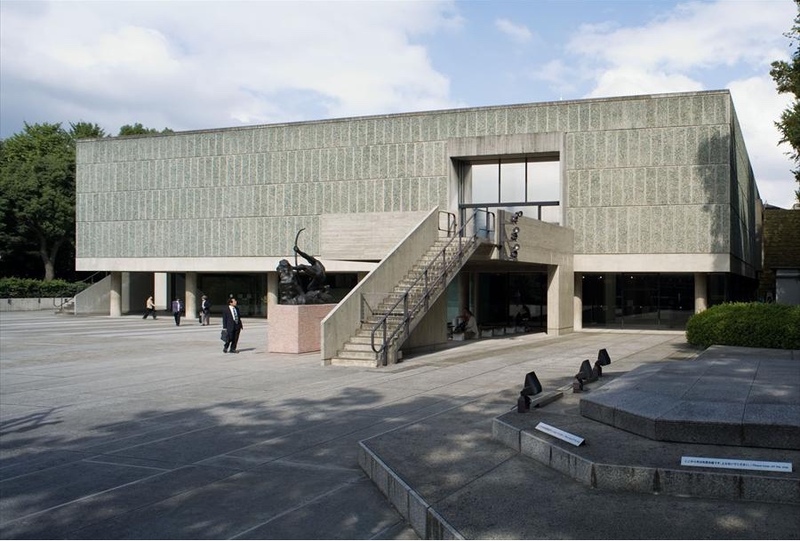 Images for Musée National d’Art Occidental via Fondation Le Corbusier. 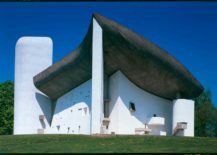 With its curving board-marked concrete roof, the Chapelle notre-Dame du Haut presented a notable shift in style for Le Corbusier. 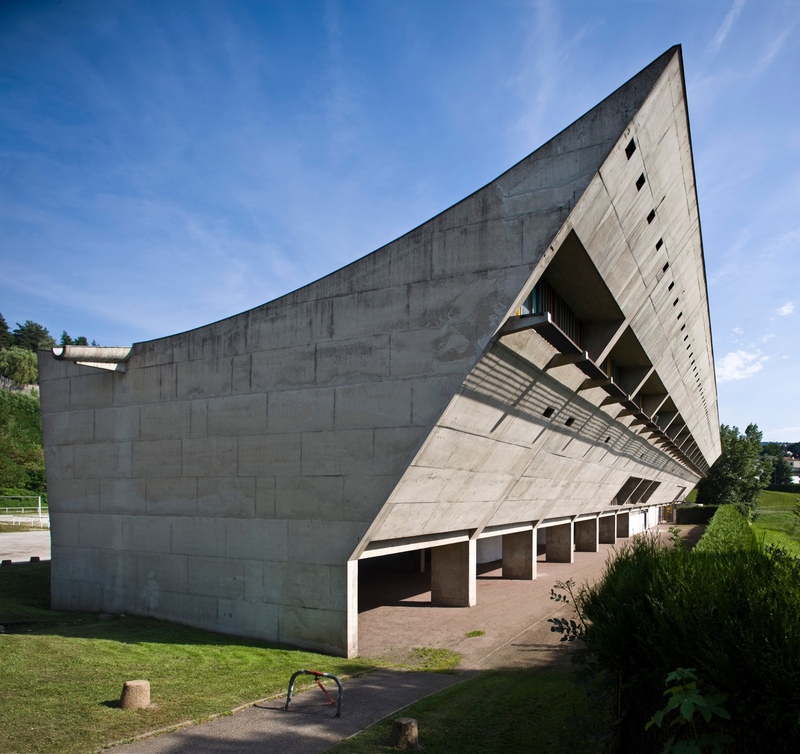 Quite different from his earlier functionalist works, it is a spectacular structure. 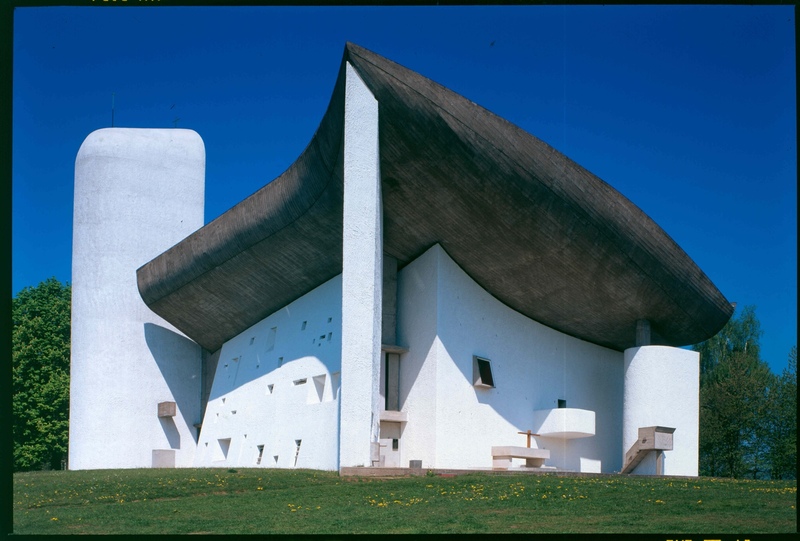 Chapelle notre-Dame du Haut, Ronchamp, France, 1950 – 1955. Photo by Paul Koslowsky © FLC/ADAGP. 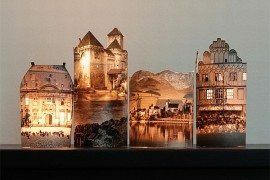 All images courtesy of UNESCO World Heritage Centre (except Musée National d’Art Occidental as noted).